I discovered the beauty of adding alcohol into baked goods this year. Initially, I thought it was a bit weird but the outcome was outstanding! This is my version of Italian beer bread. It’s best when served warm. In a small pan over medium heat add pancetta and olive oil. Brown pancetta, about 5-7 minutes. Transfer pancetta to a plate, set aside and let it cool. 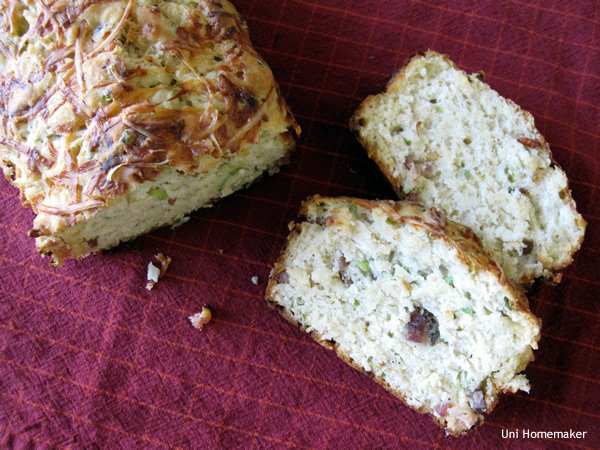 In a large bowl combine flour, baking powder, salt, scallions and parmesan cheese. Mix well. Stir in honey and beer until everything is incorporated. Batter should be on the sticky side. Pour batter into the greased loaf pan and add extra parmesan cheese on top. Then pour the melted butter on top as well. Bake for 50-55 minutes or until the cake tester/toothpick inserted into the center comes out clean. That does seem new to me, but I bet that beer helps the bread rise up all nice and fluffy?! Yes, it sure does. I would stay away from the hoppy/bitter beers, like IPA. But if that’s all you have on hand, I would add 1/4 cup of sugar to balance it out. I love this recipe! I bookmarked it to make during the holidays!